After selecting characters, your cowboys are placed on action track locations that allow you to construct buildings, houses, or roads; claim ground; earn money; or score victory points. 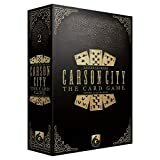 When more than one player is on the same location, get ready, it is time for a duel! 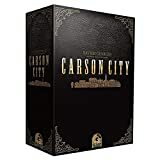 Roll the dice and see if you are the last one standing and lay claim to the goods! 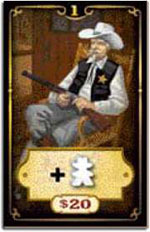 During the game, you can take various actions that earn you victory points for your plots, pistols (the hired help), and buildings. 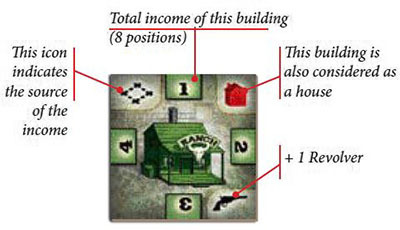 At the end of the game, your buildings, houses, mountains, and money contribute to your victory points, and the person with the most points wins. 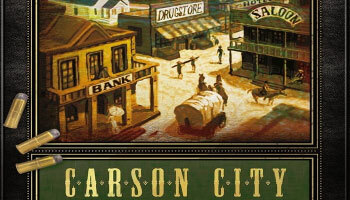 So go round up your posse of gunslingers and get ready for some Wild West action in Carson City! Every personality tile shows two different powers (common rules on the yellow side and variants on the red side). For your initial game, we recommend that you use the yellow side. In future games, the players may choose which personalities will be played during the game (either randomly chosen or decided by the players).